"Addictive and relaxing game inspired on the Incas"
With major titles like Call of Duty, Medal of Honor, Need for Speed, Diablo available, it is hard for a simple game to become a success. If you don't really like complicated games and you just want something to relax after your work, then try this one. Inca Ball is a highly addictive game inspired on the ancient civilization of the Incas. Inca Ball is kind of a bubble-shooting game with a nice story behind it, that will deliver hours of almost mindless and very relaxing fun. 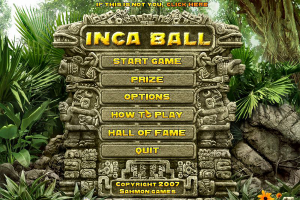 Inca Ball features really good graphics and nice animations and effects. You goal is to shoot pearls of different colors to match with those on the board. By grouping them together by color, you will make them disappear, and you can also get power-ups by doing combo moves. The game features 60 levels and 15 power-ups. By completing the levels, you will make your way to the treasure room, which is said to have more gold and precious stones than anyone could image.